Would it be crazy if I said that two weeks into being an English major has changed the way I see books? 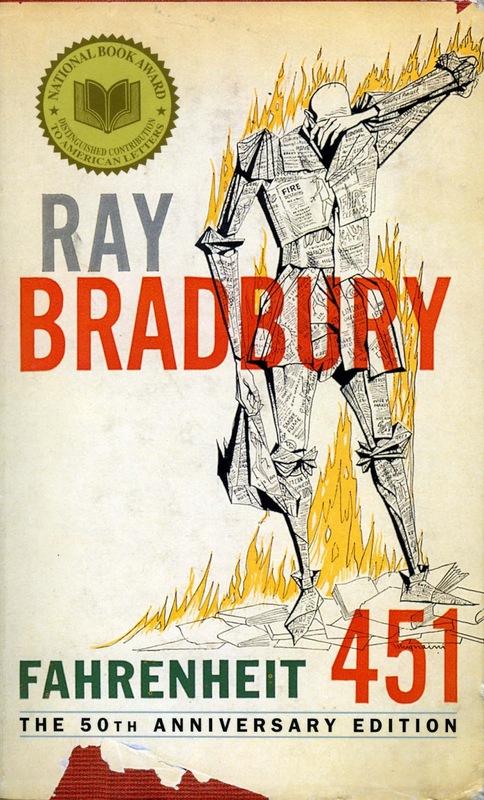 Well, I re-read Ray Bradbury's Fahrenheit 451 today; a book which I had first read only last year. In my review, if I remember correctly, I had written: "Imagine a world where books are burnt..."; which is probably the last thing you should say about this book, the part about "imagining". We live in a world where books actually ARE burnt, metaphorically, of course... um, for the most part. It's not only about censorship, the book, it's about how the world is slowly just drifting away from books, banned or not. Let me just say I am not against technology, even though I am almost entirely incapable of using most of it, or development, and I don't think the book is against that either. Bradbury mentioned in an interview of some sort (I guess) about how he saw a husband and wife walking their dog; with the wife listening to a radio and with the both of them completely unaware of the actual life surrounding them. Haven't we all seen that some place or the other? Two people in a hotel, both busy on their cellphones? The world of Fahrenheit 451 is just a blown-out-of-proportions version of what we live in. A place where books are burnt, and people are just bland faces staring at TV screens. Our protagonist Guy Montag is a fireman, in a world where firemen don't extinguish fires but start them. Speaking of great beginnings, how about this one: "It was a pleasure to burn." I mentioned in my earlier review, that I would have liked to know more about how they got to that world. This time around, I felt that what he's written was enough. It started with the minorities tearing out pages from books, until tearing wasn't enough. If you think about it, it's already started. And that's where the part about censorship comes in. I heard that Bradbury said somewhere that "the world will get madder if we allow the minorities to interfere with aesthetics." I agree, to some extent. Book don't have to show how the world should be. Most books that are censored, don't promote the things they are censored for mentioning (see: To Kill a Mockingbird, I don't suppose the person who banned it actually read it!). We have to get rid of prejudice in the real world, sure, but that doesn't mean we have to pretend in fiction that it doesn't exist. But the one thing that kept bugging me the whole time I was reading the book (not re-reading) was why this! Why books? What is it about literature that makes it so powerful, so seemingly dangerous? I may have to re-read the book a couple of times more to entirely answer that. However, I think I finally know what it is about books that I love so much, personally, what I love about reading. A book is not like a movie, that stays with you for only a little over the ninety minutes that it actually lasts. A movie or even a song makes you wonder and be awed, but it doesn't make you think. I cannot watch a movie a hundred times and get something new out of it every single time. I don't really think anyone can, not as much as with reading. It is as if books have a life of their own. If you know me, you know how I always say that books leave a lot more to interpretation. I guess it is because those few words can lead thoughts to any direction. The same few words can form entirely different pictures in different minds; the characters can relate in completely different ways to different people. And you never know where they'll take you every time. Read a book on a beach and you are transported some place else, read it in a moving train and you feel something else entirely; reading the same book when you're bored and when you're happy can make you experience things completely different. You cannot read a book without really thinking about it; analysing it, without even realizing what you're doing. You may later even forget what actually happens in that work of fiction, but those thoughts stay with you forever. And every book, every single book, gives you entirely different thoughts, opens up doors to newer thoughts and feelings. This review is a part of the Back to the Classics Challenge as a classic re-read. When I first heard of books being banned I was sure people were joking... and then I found out they were not. It's just ridiculous. Absurd. I know what you mean. It really is absurd but it happens everywhere, and it happens a lot!